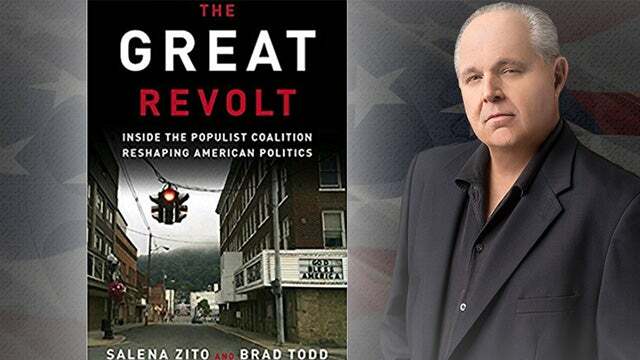 RUSH: It’s The Great Revolt by Salena Zito, and she categorized Trump voters seven different ways, the types of people they are and who they used to be and why they voted for Trump and why they will more than likely stick with him. And I will guarantee you there isn’t a person in the Drive-By Media who gets this. They’re not even interested. Salena Zito, forgive me here. There’s a part of me that does not want the left reading her book. There’s a part of me that wants them to continue to be ignorantly arrogant about the Trump electorate. But then I comfort myself, and I say, “Self, they are so arrogant, they could read it 10 times, and it’s not gonna change their minds. They’re just gonna think Salena Zito is an idiot. They’re not gonna take the time to learn who, what, where, when, why about the Trump voters because Trump voters repulse them! The Trump voters infuriate them. “They don’t want to learn about them! They don’t want to learn how to reach them. They don’t want their votes. They cast them aside officially in November of 2011.” Speaking of Salena Zito, here she is. CNN This Morning. Poppy Harlow is the infobabe that’s interviewing her. Question: “Look at the cover of the Daily News today. It says ‘Wrong Again Rudy’ talking about that Giuliani said that the president doesn’t have to comply with a subpoena, which is false. He dropped the bomb that the President may plead the Fifth. Is this aiding President Trump in any way,” Ms. Zito? ZITO: I think that what’s happening in terms of his voters, okay? Let’s just think about them for a minute. I think that they’ve made this decision to wait and see what happens when the probe is over in terms of whether they’re gonna move or not away from him. I just think they’re waiting to see what the end result is. I think they’ve made the decision, “Look, if this turns out to be that there’s a problem, he’s a bad guy, then we’re gonna deal with it.” This populist moment? He was the result of it. He wasn’t the cause of it. It’s more about them. So it’s not always just about him. RUSH: They can’t accept that. They believe Trump, just like every successful conservative… They believed it of me. When this program first started, you people were idiots, remember? You were mind-numbed robots. I was some Svengali or Pied Piper, and you didn’t know what to think, and you didn’t know what to say. You didn’t know how to vote until I told you. And to this day that is how the left characterizes every prominent conservative or Republican. They’re doing it with Trump. “Trump is some wily populist-nationalist who’s got people wrapped around his little finger. And they’re so stupid, they don’t see that Trump’s a blowhard and a phony and a liar!” They haven’t the slightest idea. They do not credit people like you with the ability to make up your own mind — and the funny thing about this is it is their voters… This is what Kanye West has been talking about. It’s their voters who are mental slaves. It is their voters who do not critically think. It is their voters who are basically just sponges. You talks about mind-numbed robots? They own them to the left.